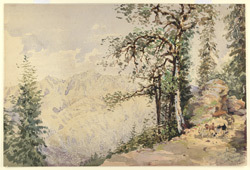 Water-colour painting showing Shali Road, Simla by Sir Richard Hieram Sankey (1829-1908) dating from June 1876. Inscribed on the front in ink is: 'The Shali Road between Mall and Mashobra; 3/6/76'. The town of Shimla is a gateway for the north-western Himalayan region and is built across a range of hills and connecting ridges. In the 19th century the town was the summer headquarters of the government of the province thanks to its favourable climate. There were several European schools, a barracks and a sanatorium here.